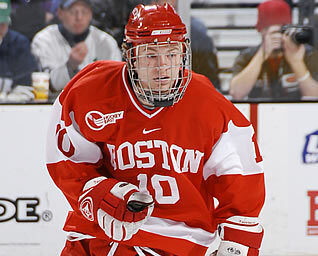 BOSTON, Mass - The Boston University men's ice hockey team scored four unanswered goals - including three in the third period - to post a 4-1 conference victory over Merrimack on Friday evening at Agganis Arena. Juniors Brandon Yip and Chris Higgins and freshmen Colin Wilson and Nick Bonino each scored for the Terriers, who snapped a three-game winless streak and gained some ground in Hockey East. Junior Matt Gilroy collected two assists on the evening and Bonino added an assist for a two-point night. Sophomore Brett Bennett stopped 17 of the 18 shots he faced to help the Terriers improve to 8-13-4 overall and 7-8-3 in conference play. Merrmick, which got a 28-save performance from junior Andrew Brathwaite, falls to 10-12-2 with a 4-12-1 league mark. The Terriers extended their winning streak against the Warriors to 12 games, sweeping the season series for the fourth straight year. After Matt Jones opened the scoring with his team-leading 12th goal of the season for Merrimack at 5:40 of the first, the Terriers evened the game when Yip poked in a shot with just over four minutes left in the opening stanza. The teams skated to a hotly contested but scoreless second period, but BU exploded for three goals in the third frame, including two on the power play, to earn the victory. Higgins netted the game winner with a nifty effort on the power play, redirecting a shot through two sets of legs - his own and Brathwaite's - at 5:12 of the third. Wilson made it a 3-1 contest in BU's favor less than four minutes later with another power-play tally when he stuffed in a rebound at the right post. Bonino tacked on another insurance goal at 13:43. The Terriers went 2-5 on the power play during the game, also killing the Merrimack power play all four times. The penalties began to add up for both teams in the third period, as both teams combined for nine penalties in the final period - including two sets of coincidental penalties.